Logins this hour: 9301 ? For sites using Amion for Enterprises, you can assign extra privileges to certain staff through switchboard accounts. Any page operator or other key person who needs to sign out staff at the last minute, add notes to the central on-call list or view additional contact information for staff (cell or home phone #s, paging service #, etc.) can be assigned a switchboard account. These can be added to your license at a per user fee equal to your schedule license fee. You will set up rights for each operator including whether they can alphapage, see private and personal details, or post switchboard notes to the master Who's on call list. For a switchboard operator, you would probably leave all options enabled. But if you want some staff to access extended contact details but not make annotations, you could disable the switchboard notes for that account. When an operator is on duty, he/she will log in using a unique password so that annotations are correctly attributed to that operator. Sample schedule. To see how the switchboard features work, go to our sample hospital-wide schedule at www.amion.com. Login using "site swi". Alpha-numeric paging. With alpha-paging enabled, switchboard staff can click on the pager number displayed and type in a message to be delivered to individual staff or groups of staff. See instructions for setting up online paging. You can also set up the system so that when someone clicks a pager link, it opens a new browser window and takes you to your hospital's paging screen. There's an option to have amion keep a log of all pages. People with switchboard rights can view recent messages to any individual or more extended logs. Blast paging. A person who oversees the entire Amion account can predefine paging groups that include on-call staff from multiple departments. People with switchboard access can then choose a group and send a message to the entire group. Annotations. Notes are a great way to make last-minute, off-hour changes to the central on-call list. Anyone who logs in to amion with switchboard rights can add a note to any shift in the master list. Notes can have times associated with them. Sign out staff. Staff with switchboard rights may sign a service or staff member to another provider at the master on-call list. The changes take effect immediately and show the new person on duty. Extended Contact Info. 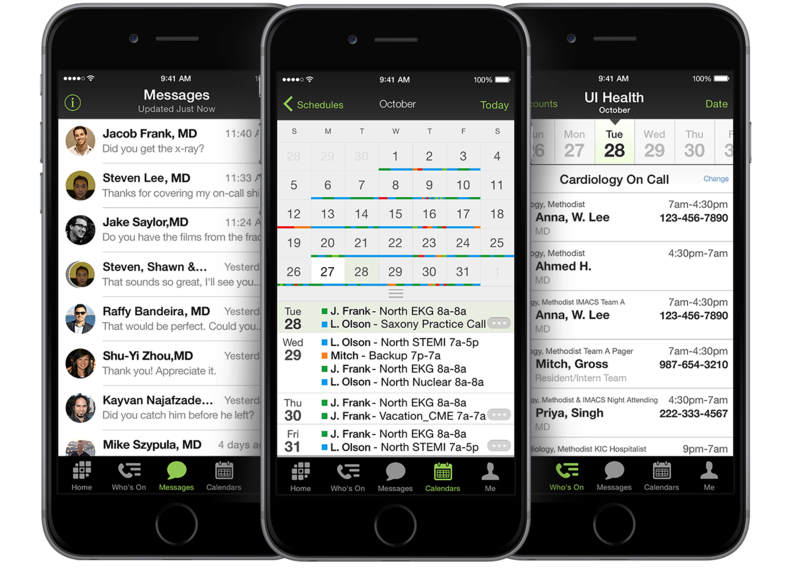 When creating schedules in OnCall, schedulers have the option to include additional contact information for each person in the schedule. This information is marked as "private" or "public" in OnCall. Only switchboard staff with a designated account can view restricted information. People with switchboard rights at amion can sign out a service or staff member to another provider. Log in at amion with a switchboard password. To change coverage for a service, select a group in the left-most column or from the "Who's on" dropdown. Click a new-note icons to the left of a shift name. From the dropdown selector on the right, choose the person who will be covering the service. You can enter text in the note field to explain the coverage change. Or leave the note field blank. If you submit a note with the same begin and end times, the note will be active from that moment until the end of the shift. Customize the times to set the hours on the coverage change. While a signout is active, the person covering the service will be listed as on duty, complete with his/her pager and other contact information. Once the end time on the signout passes, the "Who's on" list automatically reverts to the original person assigned to the service. To read the signout details, mouse over the icon. Click the icon to modify the times or the person covering the service.